We’d love your help. Let us know what’s wrong with this preview of All Mine! by Zehra Hicks. Poor Mouse. He's just about to tuck into a sandwich, when who should swoop in but Seagull - and gobbles it up. Mouse's crisps aren't safe either . . . what a greedy and ill-mannered bird he is! But Mouse has a fiendish trick up his sleeve, which just might cure Seagull of his thieving ways . . .
With striking artwork and hilarious slapstick humour, this delicious comic cape Poor Mouse. He's just about to tuck into a sandwich, when who should swoop in but Seagull - and gobbles it up. Mouse's crisps aren't safe either . . . what a greedy and ill-mannered bird he is! But Mouse has a fiendish trick up his sleeve, which just might cure Seagull of his thieving ways . 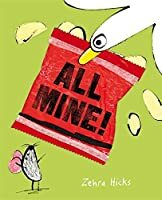 . .
To ask other readers questions about All Mine!, please sign up. Be the first to ask a question about All Mine! The mixture of real photos and drawings within the illustrations is very powerful! I also really like the actual physical feel of the pages...unlike paper in books I have previously read. This is a wonderfully presented story. Bold and bright, and brim-full of humour that will delight young readers, ‘All Mine!’ is one not to miss. Through its Tom and Jerry -style caper, it delivers clear messages about manners, snatching, sharing, actions and consequences. The mixed-media composition works marvellously. I’ve never seen such a delicious-looking cake in 2D before! This book tells a story about a bird who wants everything only for him, not sharing to others. Good values, good illustration.